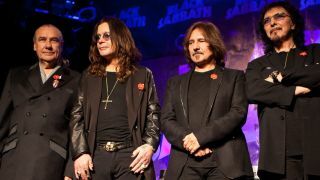 Ozzy Osbourne hopes drummer Bill Ward is fit to take part in Black Sabbath's last album and tour, planned for next year. Ward sat out recording sessions and the tour for current album 13,saying he was not happy with the contract on offer. But Ozzy says the iconic metal band would love to have the founding member back behind the kit for their farewell record and tour, because he deserves his place in what will be the final piece in the band’s legacy. Ozzy tells Esquire: “If this is Black Sabbath’s last hurrah, then we’ll have ended it on an up note rather than when I left in 1979 and everybody was fucked up on one thing or another and I was marked out as being the worst. The singer adds that once Sabbath call it quits, he will go right back to his solo career because he can’t juggle the two projects at one time. He says: “I’m not one of these guys to do my solo stuff one night and Black Sabbath the next. I can’t do that. It’s too much to handle. “So with the Sabbath thing, the record company wants us to do one more record, and we’ve decided to do one more tour, and at the end of the tour we just disband and I go back to doing my solo stuff. In an exclusive interview with Metal Hammer last month, Ozzy revealed the plans for a final album and tour.